IBM this week opened a new Cloud Resiliency Center to help enterprises mitigate business interruptions and recover from disasters. The company said the state-of-the-art facility in Research Triangle Park, N.C., provides cloud-based business continuity services to protect against potentially costly business disruptions. 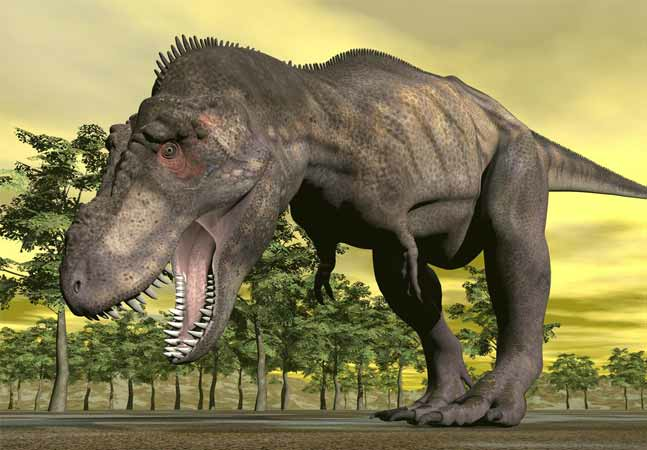 Such disruptions can be quite costly, according to recent research. 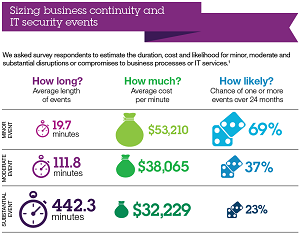 IBM pointed to a Ponemon Institute study it commissioned that pegged the cost of a long-lasting outage at $32,000 per minute on average. Beyond that, in these days of instant social media commentary on any major corporate problem or outage, long-lasting disruptions can harm a company's reputation and impact future revenue. The cloud-hosted center seems fitting, as cloud computing comes with all kinds of security implications. For example, other recent research indicates cloud computing itself can increase the risk of costly security problems, while yet other research found the No. 1 expected benefit of enterprises moving to the cloud was "disaster avoidance/recovery and business continuity." The new North Carolina center joins IBM's stable of 150 such centers in 50 countries. The company plans to open two more resiliency centers this year in Mumbai, India, and Izmir, Turkey. 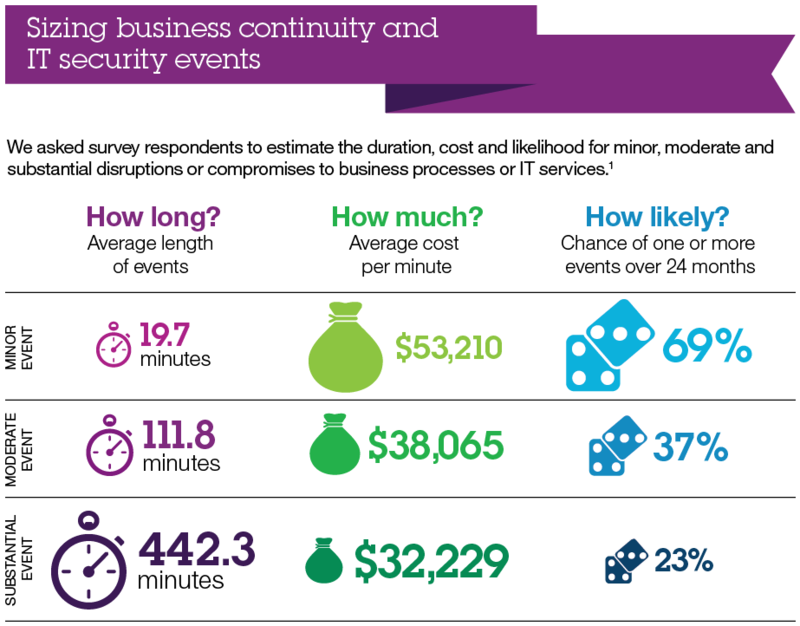 Of course, IBM isn't alone in chasing the growing market for cloud-based business continuity and disaster recovery services. Other industry heavyweights such as HP, VMware and Microsoft offer similar services, along with numerous smaller companies. According to Microsoft-sponsored research conducted by Forrester Consulting, "Forty-four percent of enterprises either are extending disaster recovery to the public cloud or plan to do so. And 94 percent of enterprises that are doing disaster recovery to the cloud say it helps to lower costs and improve service-level agreements." Watson is back. The "Jeopardy!" champion has graduated from winning T.V. game show competitions to fighting cancer and other important pursuits, and IBM says it will soon be able to answer your Big Data queries in the cloud. IBM yesterday announced Watson Analytics will provide cognitive artificial intelligence to the company's cloud service users, who can perform Big Data analytics with natural language queries. 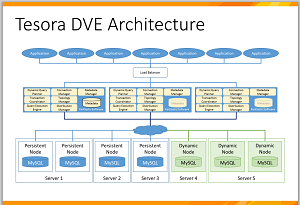 Initially, it will be a "freemium" service running on desktops and mobile devices, bringing Big Data analytics to the masses without the hassle of messing around with the complicated Apache Hadoop ecosystem or needing arcane data science skills. IBM's Alistair Rennie said in a video that companies want to use analytics and better-informed decisions to change and improve every part of their businesses. However, he said, "the current generation of tools that they have get locked up in IT or in the domain of data scientists. And we just want to break that wide open and change the game by allowing every user in every business to have incredibly powerful analytics at their fingertips." IBM said it obviated the need for specialized skills with three main innovations: a single business analytics experience; guided predictive analytics; and natural language dialogue. The single experience is in contrast to other solutions that involve different analytics tools for different kinds of jobs. Watson will provide a seamless, unified way to use enterprise-grade, self-service data analytics in the cloud. The guided predictive analytics finds hidden key facts relevant to your queries and discover patterns and relationships that would otherwise wouldn't be found. 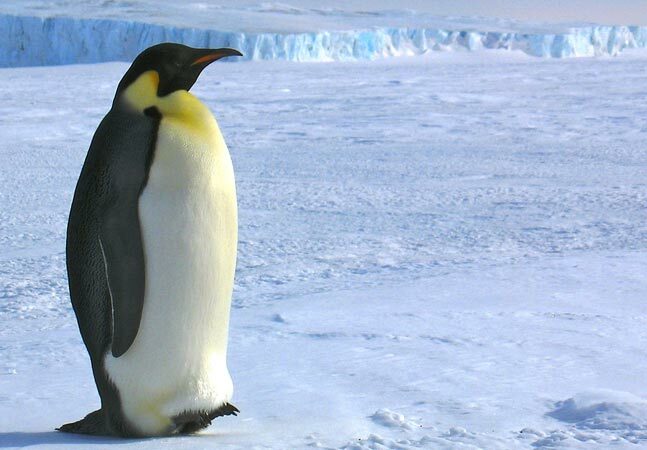 These in turn lead to new queries and fine-tuning to get to specific insights. The natural language dialogue enables Siri- or Cortana-like questions, though you won't be able to speak to Watson (yet). You will, however, be able to ask questions such as: "What are the key drivers of my product sales?" and "Which benefits drive employee retention the most? "^ and "Which deals are most likely to close?" After some beta testing (sign up here) of capabilities that will be made available in the next month, the service will be offered in a variety of free and paid packages in November. 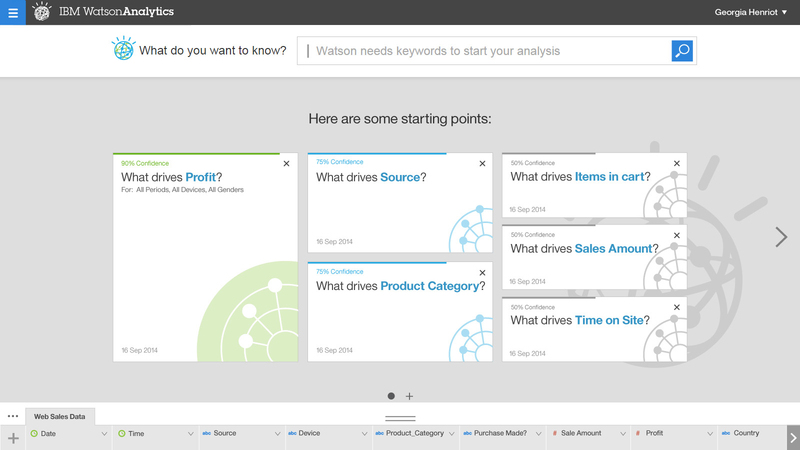 "Watson Analytics offers a full range of self-service analytics, including access to easy-to-use data refinement and data warehousing services that make it easier for business users to acquire and prepare data -- beyond simple spreadsheets -- for analysis and visualization that can be acted upon and interacted with," IBM said in a statement. 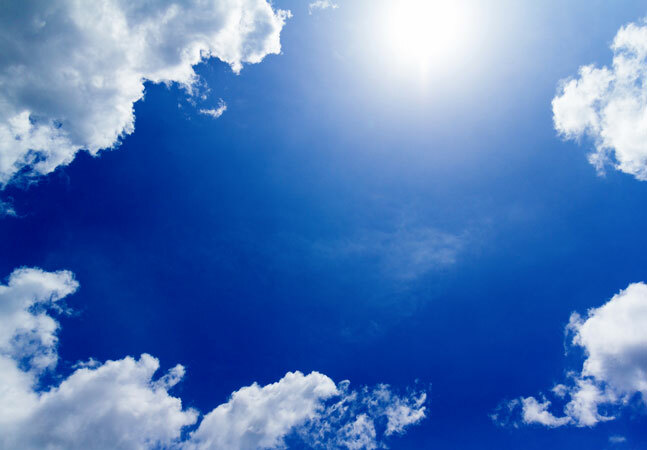 The service will be hosted on IBM's SoftLayer cloud computing infrastructure provider and made available through the company's cloud marketplace, with future plans to make it available through Bluemix -- an implementation of the companies Open Cloud Architecture -- letting developers and independent software vendors use its functionality in applications they build. Though IBM characterized yesterday's news as "its biggest announcement in a decade as the leader in analytics," it's not the company's first foray into cloud-based Big Data analytics. In June it announced IBM Concert software -- also available in the cloud marketplace -- targeting four of today's hottest transformative technologies: cloud, Big Data, social and mobility. Now, Rennie said, the company is "blending the cognitive experience with the predictive experience" for enhanced analytical capabilities. Watson, following on the heels of IBM's Deep Blue chess-playing supercomputer, gained national recognition in 2011 by beating top human champions on the T.V. quiz show, "Jeopardy!," winning a $1 million prize that was donated to charity. 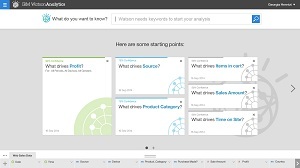 The company first announced Watson Analytics in January as one of three new applications available in the Watson Group, into which the company said it was sinking a $1 billion investment. In a recent survey, half of the companies using cloud computing said they have benefitted by avoiding disasters and keeping the business running. "Disaster avoidance/recovery and business continuity, as cited by 73 percent of all respondents, was the number one expected benefit of moving to the cloud," the survey report by Evolve IP said. 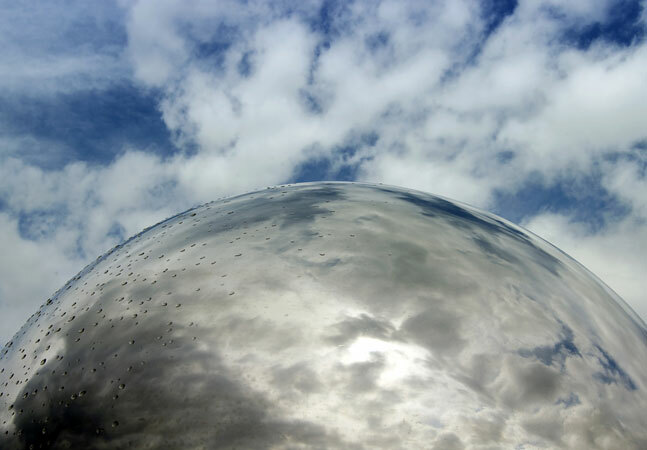 "Of those with services in the cloud, five in 10 respondents indicated that they had already experienced that benefit. 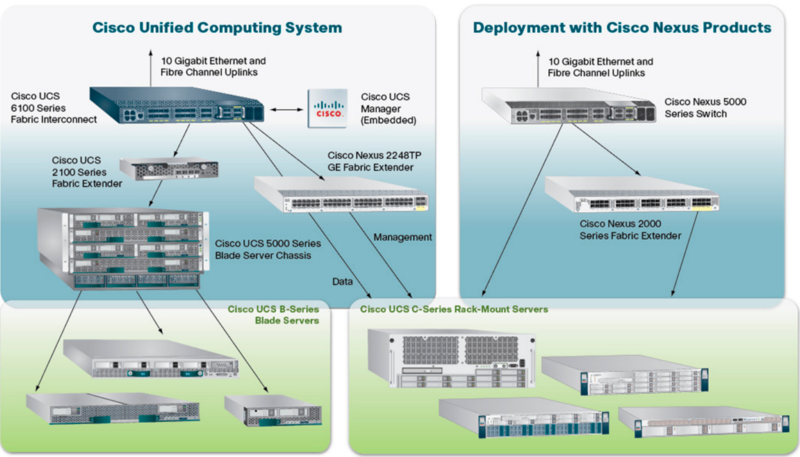 Improved flexibility (65.5 percent) and scalability (65 percent) followed suit." Evolve IP, a communications and cloud services company, polled 1,275 IT pros and executives involved in cloud approval or implementation, focusing on Infrastructure as a Service (IaaS) and concentrating on IT and executive beliefs; service adoption; cloud implementation; expectations and barriers; and budgets. 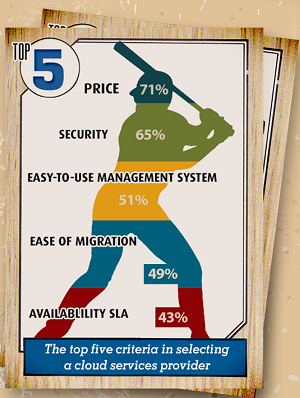 Most of the survey results were predictable, such as: the cloud is wicked popular. 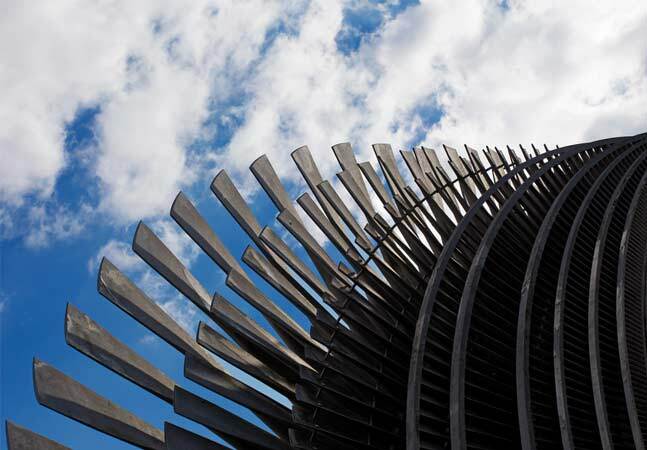 Nearly nine out of 10 respondents regard the future of IT as being in the cloud, and 81 percent said they've deployed at least one cloud service. Extrapolated to an average, respondent organizations have deployed 2.7 services to the cloud. [Click on image for larger view. ]Evolve IP's baseball-themed illustration of the top reasons companies move to the cloud. The survey also asked if respondents were "cloud believers." To that question, 70 percent of higher-level executives answered in the affirmative, while 58 percent of their lower-level manager counterparts agreed, which was five percentage points higher than a similar survey conducted last year. "The upward trend of faith in the cloud among IT managers is notable since it's the IT managers who are often required to manage the deployment of cloud services, demonstrate the tangible benefits of cloud migrations, and select the vendors that will assist with deployments," Evolve IP said. 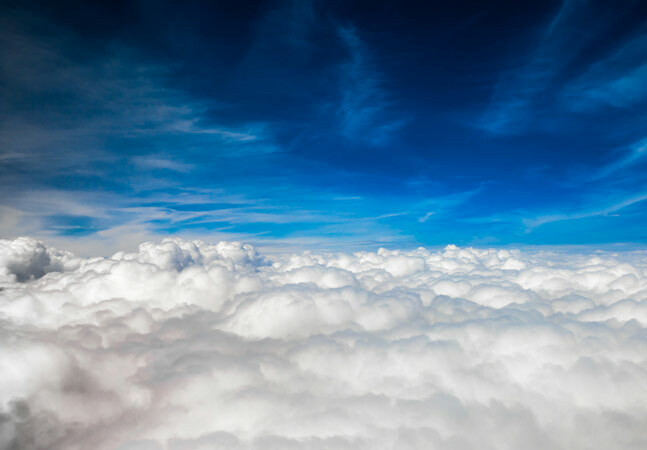 Of those who have actually moved to the cloud, the overwhelming virtualization hypervisor of choice was VMware ESX, favored by more than 82 percent of respondents. Citrix Xen came in second at 26 percent and KVM was third at 6 percent. However, when it came to deploying apps, Citrix scored somewhat better. It was used by 28 percent of companies deploying JD Edwards applications, compared to 33 percent on VMware. DB2 applications were also more competitive, with Citrix clocking in at 36 percent and VMware at 44 percent. On the problematic side of things, there was less worry than last year about concerns and barriers regarding cloud implementations, though the primary concerns were the usual big three: security, legal/compliance and privacy. 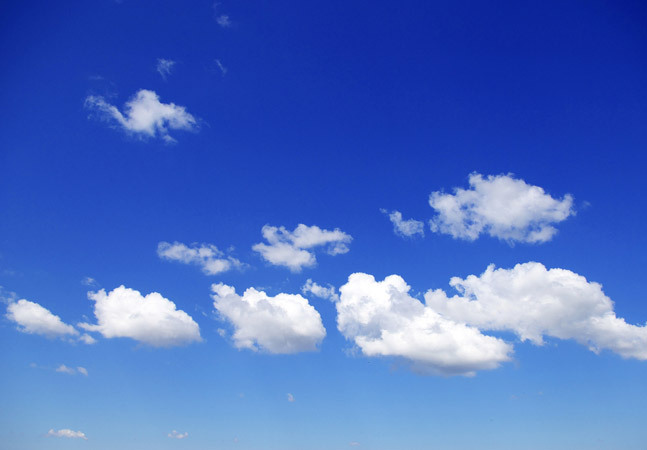 Survey respondents are slowly gaining more knowledge about the cloud. 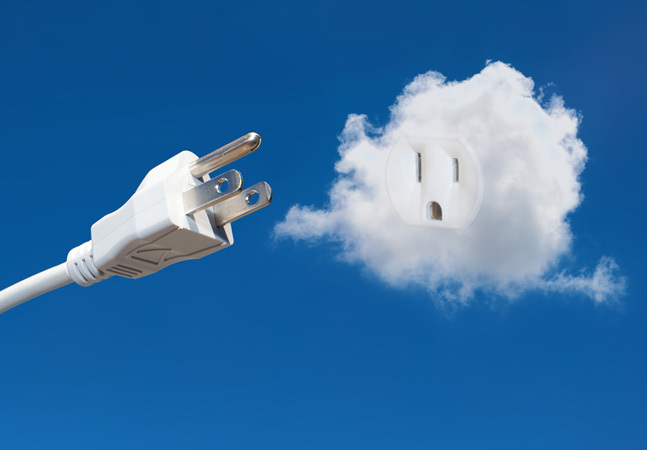 Overall, concerns about moving to the cloud have decreased. IT managers are coming around to the cloud, but are not yet as enthusiastic as their directors and executives. The number of services in the cloud continues to grow. Adoption of Microsoft products in the cloud is increasing. Servers/datacenters, desktops and phone systems all saw greater plans for adoption compared to 2013. "This year's survey reinforces last year's data with a few major changes," said Evolve IP exec Guy Fardone. "We continue to see across the board drops in barriers to moving to the cloud and more support from IT managers as they've become more aligned with business executives. Also, as we have seen in our business, companies looking to move to the cloud on their own are experiencing some hiccups along the way. 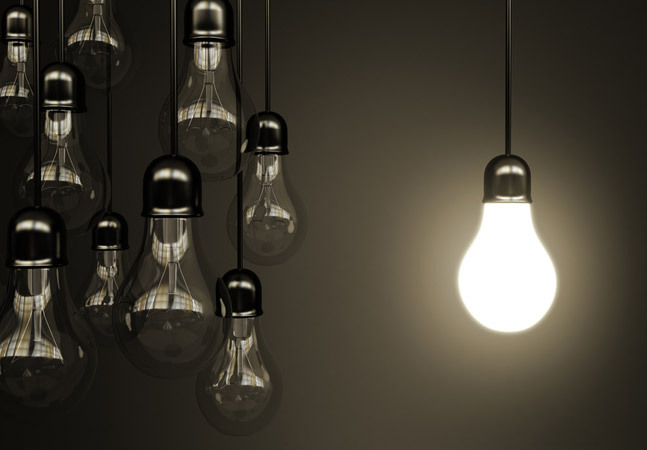 As a result, almost one in four organizations will use a third-party provider." 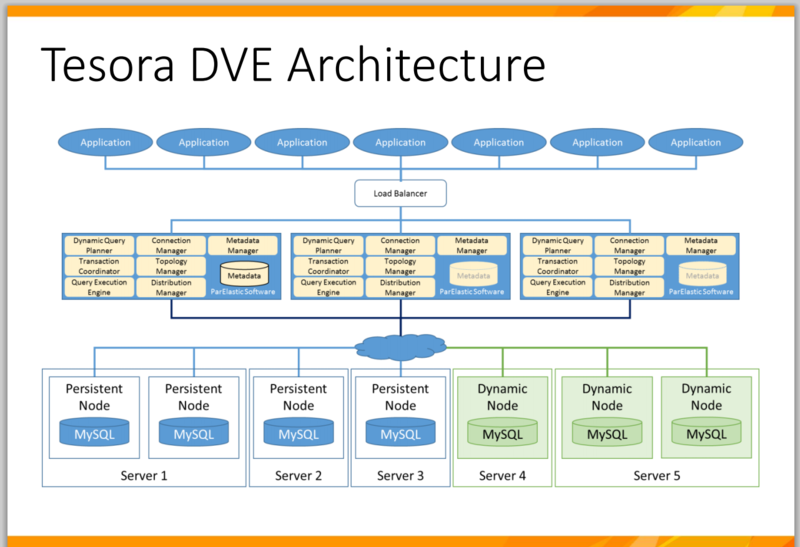 Evolve IP is just such a third-party provider and, unsurprisingly, was singled out by Fardone as a good candidate for that job. Silver Peak Inc. today announced a WAN fabric aimed at unifying enterprise networks with public clouds and optimizing Software-as-a-Service (SaaS) traffic by constantly monitoring service performance and orchestrating traffic according to the current "Internet weather." 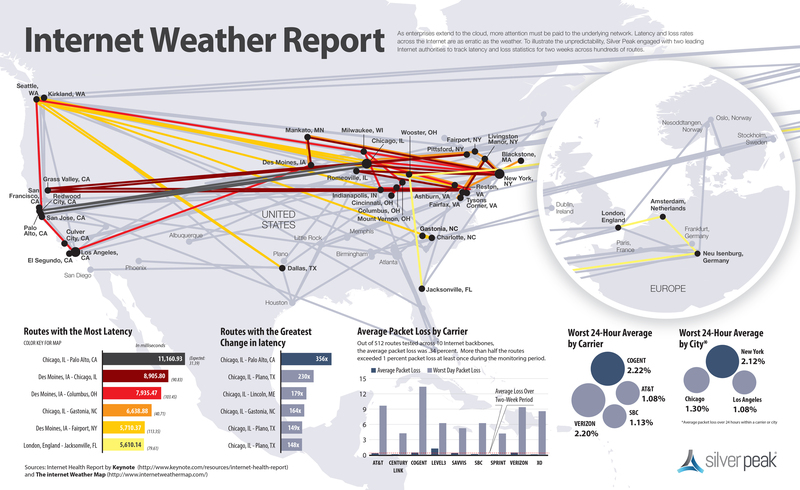 Called Unity, the "intelligent" fabric provides a complete map of the cloud-connected network and uses new routing technology so enterprises can manage and optimize SaaS connectivity and bypass heavy weather -- or congested paths. 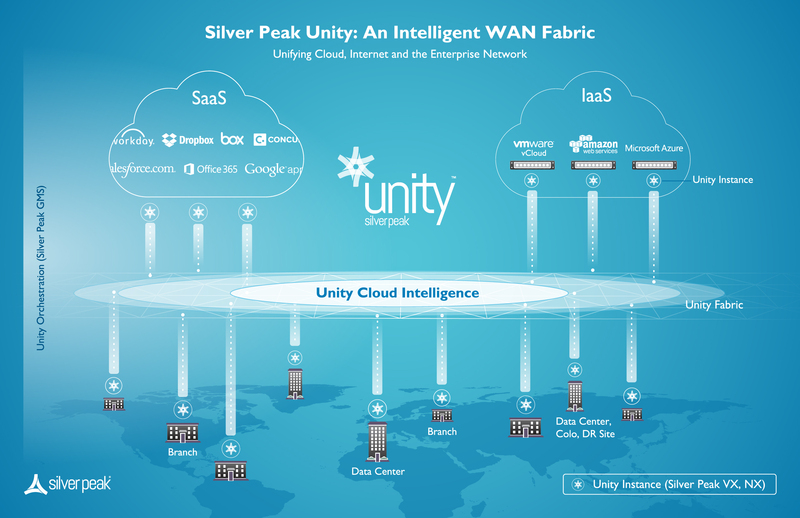 The Unity fabric is a network overlay generated by company software running in data centers, remote offices and cloud interconnection hubs along with the company's Cloud Intelligence Service. The fabric smoothes out connection performance for any combination of services, SaaS applications or Infrastructure-as-a-Service (IaaS) resources. Unity instances use data collected by the cloud intelligence -- including the physical locations from which data is being served -- to track metrics such as data loss and network latency, which is then shared with other instances so optimal paths can be selected for any user to any SaaS connection. 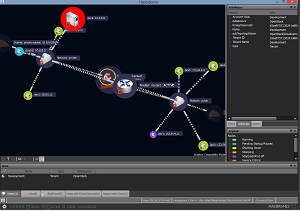 Another piece of company software, the Global Management System, orchestrates the optimization. In addition to the advanced WAN routing and cloud intelligence, the Unity fabric also features accelerated encryption; data reduction achieved through WAN compression and deduplication; path conditioning that reconstitutes dropped packets and re-sequences those that might take multiple paths; and traffic shaping that prioritizes classes of traffic, giving the least attention to personal or recreational use, for example. "SaaS has taken business productivity to new heights, but it has also dramatically changed the dynamics of IT networking," said company exec Damon Ennis. "The weather on the Internet can be congested one minute and tolerable the next, making the performance of cloud services unpredictable. Even worse, your IT staff has no way to monitor traffic to the cloud once it leaves the WAN. Silver Peak's Unity fabric gives them capabilities they've never had before. 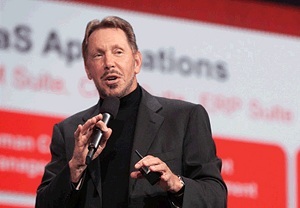 It turns the Internet into your own private, high-performance network and brings SaaS under the control of IT." Unity support leading IaaS providers such as Amazon Web Services (AWS), VMware vCloud and Microsoft Azure. That includes more than 30 individual SaaS applications such as Microsoft Office 365, Dropbox, Salesforce.com and Adobe Creative Cloud. Eventually, the company said, "every" SaaS app will be supported. One vCloud user, Nevro Corp., professed enthusiasm for the new solution. "The rate at which our employees use cloud services has spread like wildfire," said Nevro exec Jeff Wilson. "With users in different parts of the world, I was not only finding it difficult to maintain consistent performance for my users, but I've been constantly surprised by new cloud applications popping up on users' screens. Silver Peak has already been an instrumental partner in helping us accelerate data mobility for our VMware vCloud environment, and I'm excited to see Silver Peak Unity extend that expertise to give me the ability to control the performance and management of our core cloud-based services. Now we can punch a hole through to the systems that drive our business." Silver Peak said Unity will help address those new cloud apps popping up on users' screens, exemplifying the problem of "shadow IT" in which staffers might use their own devices to access cloud services or unofficial cloud service providers without organizational knowledge or control. The company quoted a McAfee-sponsored study in which 81 percent of line-of-business workers and 83 percent of IT staff admitted to using non-approved SaaS apps. Subscriptions to the Cloud Intelligence Service are $5,000 per enterprise, per year with unlimited SaaS application support, the company said, while Silver Peak software instances start at $551 per year. "To optimize their networks for SaaS, new customers must purchase a minimum of two Silver Peak software instances and a subscription to Unity Cloud Intelligence," the company said. 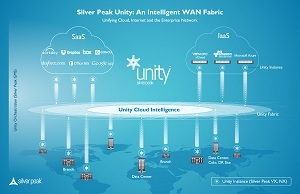 "Existing Silver Peak customers simply need to upgrade their Silver Peak software to release 7 and subscribe to Unity Cloud Intelligence. 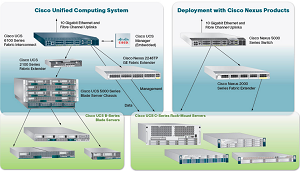 Customers can expand their networks by adding Silver Peak instances in cloud hubs or IaaS providers." I figured the government was on top of cloud security. Awareness of the issue couldn't be much higher, what with all the news of data breaches and software vulnerabilities. Everyone is going to the cloud -- including Uncle Sam -- and security is always of paramount concern. 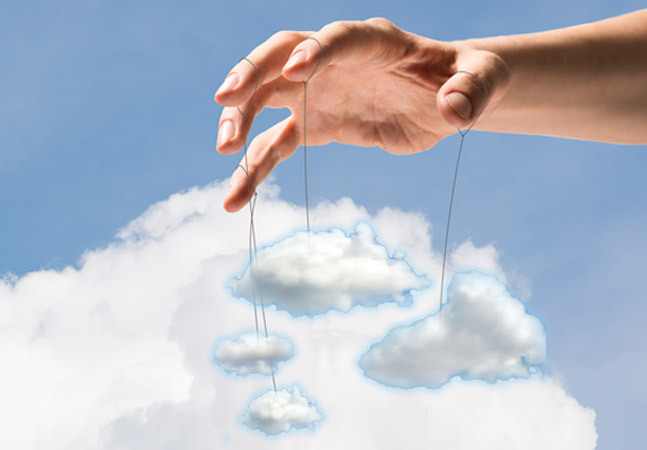 As a Ponemeon Institute report revealed in a study about the "cloud multiplier effect," moving to the cloud brings increased security concerns. Cloud adoption isn't a new phenomenon anymore and with maturity of the technology comes decreased concern about security, according to the RightScale "2014 State of the Cloud Survey." 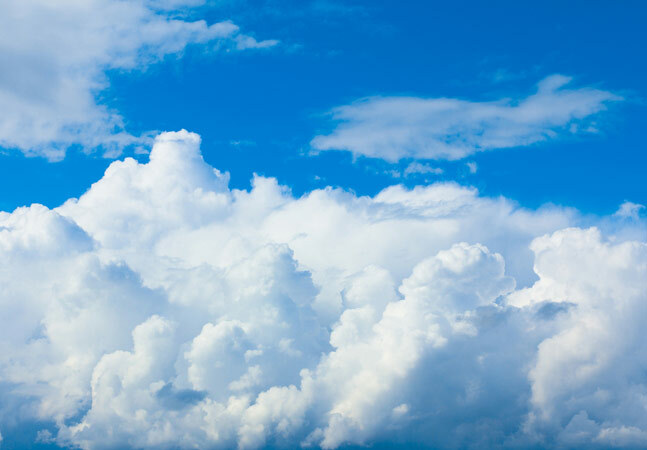 "Security remains the most-often cited challenge among Cloud Beginners (31 percent) but decreases to the fifth most cited (13 percent) among Cloud Focused organizations," the RightScale report said. "As organizations become more experienced in cloud security options and best practices, the less of a concern cloud security becomes." Well, the government should be getting experienced. 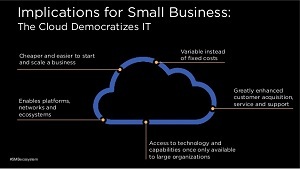 President Obama's "cloud first" initiative was announced in 2010. Sure, the program had some rough spots. A year later, CIO.gov reported "each agency has individually gone through multiple steps that take anywhere from 6-18 months and countless man hours to properly assess and authorize the security of a system before it grants authority to move forward on a transition to the cloud." 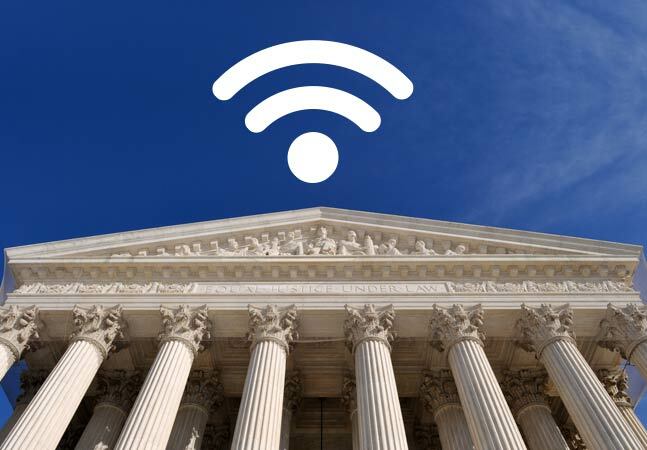 To address that red tape, the Federal Risk and Authorization Management Program (FedRAMP) was enacted to provide "a standardized approach to security assessment, authorization, and continuous monitoring for cloud products and services." That led to 18 cloud services providers receiving compliance status and a bunch more in the process of being accredited. 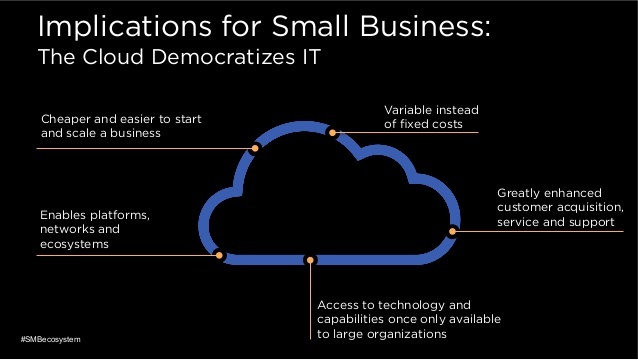 So now we have government-tailored cloud services available or coming from major players such as Microsoft, Amazon Web Services Inc. (AWS) and Google Inc., along with a host of lesser-known providers. So, like I said, I figured the government was all set. 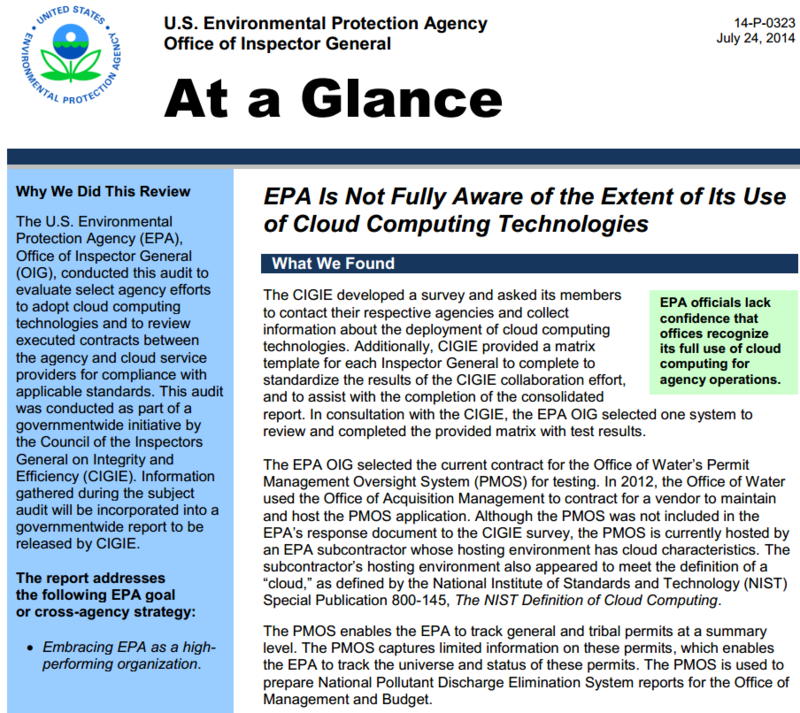 Then I read about a report issued last month with the alarming title of "EPA Is Not Fully Aware of the Extent of Its Use of Cloud Computing Technologies." [Click on image for larger view.] 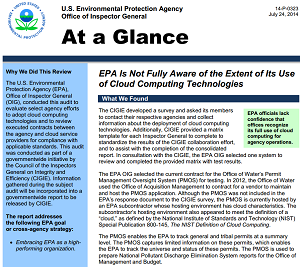 Report on EPA Cloud Usage: "The EPA did not know when its offices were using cloud computing." "Our audit work disclosed management oversight concerns regarding the EPA's use of cloud computing technologies," reported the U.S. Environmental Protection Agency's Office of Inspector General. "These concerns highlight the need for the EPA to strengthen its catalog of cloud vendors and processes to manage vendor relationships to ensure compliance with federal security requirements." The EPA didn't know when its offices were using cloud computing. Which opened up a whole BYOD/shadow IT can of worms. Sure, the government addressed that issue. It addresses every issue. But if the EPA doesn't know when its offices are using cloud computing, how can the federal government know what each of its more than 2 million employees are doing with the cloud from their individual devices? An article last year in Homeland Security Today found "Federal BYOD Policies Lagging." "Tens of thousands of government employees show up for work every day with a personal mobile device that they regularly use for official work," the article said. "Yet few, if any, of those employees have knowledge of their agency's policy governing how and when personal mobile devices can be used, or what information they are allowed to access when using those devices." And that's not to mention the shadow IT problem, as reported in an article by Government Computing News titled "Is Shadow IT Spinning out of Control in Government?" "People need to get their work done, and they'll do anything to get it done," said Oscar Fuster, director of federal sales at Acronis, a data protection company. "When tools that can help them appear in the marketplace, and in their own homes, they chafe when administrators do not let them use them. The result often is an unmanaged shadow infrastructure of products and services such as mobile devices and cloud-based file sharing that might be helpful for the worker, but effectively bypasses the enterprise's secure perimeter." What's even more worrisome is that federal exposures can be deadly serious. Regular enterprise data breaches can cost a lot of money to organizations and individuals, but government vulnerabilities can get people killed. Think about covert agents' identities being revealed in Snowden-like exposès or Tuesday's revelation by Time that New Post-Snowden Leaks Reveal Secret Details of U.S. Terrorist Watch List." "The published documents describe government efforts using the Terrorist Identities Datamart Environment (TIDE), a database used by federal, state and local law-enforcement agencies to identify and track known or suspected terrorist suspects," the article states. And how about more organized threats? Yesterday, just a day after the Time article, The Washington Post published this: "DHS contractor suffers major computer breach, officials say. The victimized company said the intrusion "has all the markings of a state-sponsored attack." That means we're being targeted by foreign countries that want to do us harm. And it's been going on for a while. VentureBeat last year reported that "Chinese government hackers are coming for your cloud," and last month The Guardian reported via AP that "Chinese hackers 'broke into U.S. federal personnel agency's databases.'" And those are just a few of the attacks that the public knows about. If Russian hackers can steal more than 1 billion Internet passwords, as reported Tuesday by The New York Times, who knows what Russian government-backed hackers have been doing? Scarier still, judging by the aforementioned three attacks revealed in the past three days alone, the pace of attacks seems to be picking up -- just as government cloud adoption is picking up. "Federal Cloud Spending Blows Past Predictions," Forbes reported last month. "Today, U.S. federal government cloud spending is on the rise as government agencies beat their own predictions for fiscal 2014," the article said. I know the feds are addressing the cloud security issue, but government resources will probably be trending down and government red tape can make things so complicated I fear for the effectiveness of security precautions. AWS alone, in noting that its government cloud service "has been designed and managed in alignment with regulations, standards and best-practices," lists 12 such programs, with names like "SOC 1/SSAE 16/ISAE 3402 (formerly SAS70)" and "FIPS 140-2." If the government can bungle a much-publicized Web site rollout of this administration's signature health care program, how can all the individual entities moving to the cloud correctly implement their systems, even if the cloud service is properly vetted? Yes, the allure of cost savings, efficiency and innovation provided by cloud solutions is great, but at what risk?